Chelsea midfielder Jorginho held transfer talks with Manchester United and Liverpool among other clubs before moving to Stamford Bridge from Napoli this summer. The 26-year-old shone in his time in Serie A and it’s little surprise that elite clubs were queuing up for his signature ahead of this season. 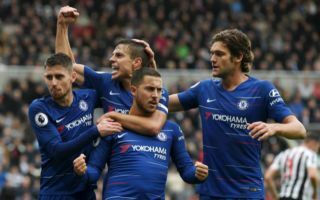 Jorginho has gone on to prove himself a key figure at Chelsea with a fine start in the Premier League, but his agent admitted he could easily have gone to another English club. Liverpool and United are among those mentioned by his representative Joao Santos, as well as Manchester City and Tottenham. ‘There were calls from Liverpool , Manchester United , Manchester City, Tottenham and Chelsea,’ Santos told ESPN. ‘In a way all the big English clubs saw Jorginho because he was already in the Italian national team. based on an agreement with Napoli. Jose Mourinho could certainly have done with Jorginho over Fred, who joined the club from Shakhtar Donetsk but who has struggled at Old Trafford. The Italy international could also have been a superior option for Jurgen Klopp over Fabinho, who plays a similar role but who has been slow to settle at Anfield.